In order to take strong reformative steps towards Railway passengers’ security and amenities, a National Level Workshop was held today i.e. 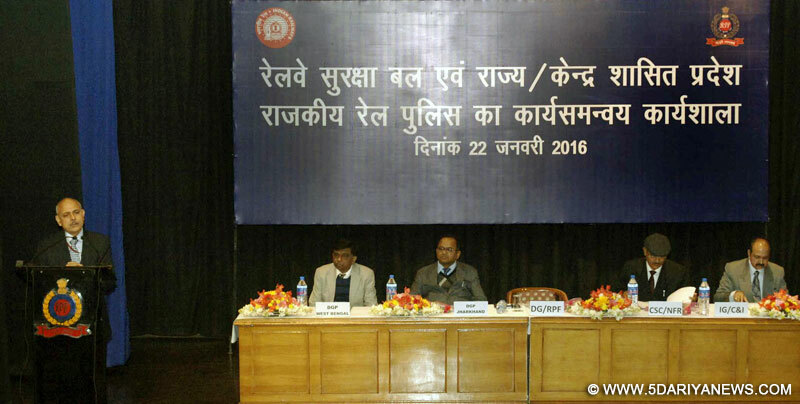 22.01.2016 which was inaugurated by the DG/RPF, Shri Rajiva Ranjan Verma. DGP/West Bengal, DGP/Jharkhand, IG/C&I, CSC/NFR and other senior Railway Board Officials, RPF & GRP Officials were present among others. All the State Heads of GRP were also present in the Workshop. Speaking on the occasion, Director General/RPF, Shri Rajiva Ranjan Verma said that an urgent need of organizing a National Level Workshop was felt in the background of arising threat perception and recent terrorist attack which happened recently in Pathankot. He said that the Workshop is being organized to tackle other crime situations rather than day to day crime incidents. He indicated that the Railway is one of the vulnerable targets because Indian Railways operation areas have open boundaries. He explained that the Workshop is organized to sensitize all the security personnel throughout India to extend a courtesy and assisting behaviour to all railway passengers. He further said that the workshop is organized to synergise the energy where security personnel can supplement and complement each other. Stressing on the security measures, DG, RPF said that to protect human trafficking GRP and RPF are working in collaboration with each other and security personnel are being sensitize to adopt a passenger-friendly behaviour. He also informed that the RPF is committed to provide best security measures and is using around 400 sniffer-dogs to detect explosive and arms.